Retro Friday is a weekly meme hosted here at Angieville and focuses on reviewing books from the past. This can be an old favorite, an under-the-radar book you think deserves more attention, something woefully out of print, etc. Everyone is welcome to join in at any time! I include roundups from participating bloggers in my weekly post. It's been around five years since I first ran across Enthusiasm by Polly Shulman. And, honestly, when I think about it, I'm fairly certain I got this recommendation from Stephenie Meyer's website way back in the day. I believe she had it on her list of recommended reads and I picked it up based on that and the fact that it had a Jane Austen angle. It seems like there are so many of those these days, but at the time I hadn't read many. I'm very glad I did pick it up, as this is a perfectly delightful, perfectly quick read that entertains and leaves a grin on your face. I still don't see it around very much, but I'm happy to see Ms. Shulman has a new book that came out last year. Definitely need to go check that one out since I read this one in a single sitting. As far as the covers go, what do you think? I'm always interested to see where they go when they change it between hardback and paperback releases. I think it's interesting the slight shift they took on the paperback, lightening the background and adding the Austen figures to highlight that aspect of the story. Probably a good idea, but I do find myself sort of preferring the bright, simple colorblock of the hardback. This sweet, smart little novel follows 15-year-old Julia Lefkowitz who loves Jane Austen. Enter her best friend Ashleigh the Enthusiast. "There is little more likely to exasperate a person of sense than finding herself tied by affection and habit to an Enthusiast." Ashleigh moves from one obsession to another like they're going out of style. But she always, always devotes her whole self, heart and soul, to whatever the obsession of the day is. And most recently, rather unexpectedly, Ashleigh has decided to follow her less enthusiastic friend Julie's lead and adopt Austen as her latest obsession. Specifically Pride and Prejudice. In short order, she's talking like Elizabeth Bennet, dressing like Elizabeth Bennet, and dragging poor Julia off to crash an all boys school cotillion in search of a Darcy and a Bingley apiece. Suitable young men are found (naturally), the charming Ned and Parr, but which one is which and just who is actually in love with who? 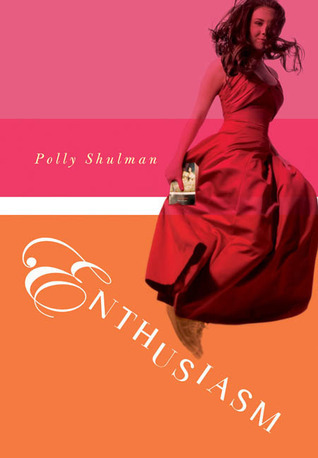 Delightful and quirky, full of sly Austen references, and even a play within a play, Enthusiasm is easy to fall for. In fact, I stayed up late in the closet reading this one after a particularly long and trying day. This was back when I lived in a room with a walk-in closet. Don't you love those for reading in late at night, or is that just me? I remember I had one as well when I was around 14 years old and, let me tell you, I spent many a night cozied up in that space, surrounded by hemlines, shoes, and a good book. In this case, I really liked these two girls. The reserved one and the vivacious one, together they are the real deal when it comes to being friends. So much so that when misunderstandings arise, they stick it out, even if it means (as it does here) one of them swallowing a rather hefty helping of disappointment for much of the book. But I loved their friendship and I loved the swoony romance that develops between Julie and one of the young lads (not telling which one). Complete with first kisses, climbing in and out of windows, and sonnets pinned to trees. Be still my heart. Genuine and sweet, Enthusiasm has stayed on my shelf over the years, for whenever I need a little modern-day Austen in my life. This really does sound quick and cute, definitely worth the small time commitment! I think I like the PB cover with the Austen figures in the background better just because, with no prior knowledge of the book, made me want to read it. I really loved this book as well as Shulman's other book The Grimm Legacy. I think I picked it up based off of Stephenie Meyer's rec too! I'm not sorry I did, either, cause it's a favorite of mine. So much fun. I always like the idea of these kinds of books, but I always find myself somewhat disappointed...however, I will check this one out from the library. But Jane Austen!!! <3 I just started Persuasion for the first time last night! I wasn't overly fond of the movie, but apparently it's a great Austen favorite, so we'll see. P.S. about Ella Enchanted: the movie is nothing like the book. they took the character's names and the concept of being cursed with obedience and made their own story. As such, I was mortified that they took something as wonderful as the book and changed it into a comedy that made fun of fairy tales. So I strongly dislike the movie. However, my friends who haven't read the book love it. I suppose its funny by itself, but when I compare it with the book, I cringe. The prince is handsome though. I like the premise of this book! And that cover is really cute! how have I never heard of this? I love Austen! My girlfriend's favorite, she really appreciated it as a gift for our anniversary. I like the friend stealing your enthusiasm--very girl. But unfortunately I have never been able to get through a single Jane Austen book or even when zombies were added (and that's saying something from me). So I would probably miss all the real art to the book. Allison, see, it definitely does its job. That's good. Bookworm, oh good! I'm glad to hear the second one is good as well. Lizzy, yes, I usually feel the same . . . wariness. But this one is cute. And I will confess I envy you getting to read PERSUASION for the first time. That is one of my favorite reading memories. As for ELLA, I understand. Will not be watching it. And I will bump the book up in the TBR thanks to you. Sharry, yeah, I like it, too. Diana, hee. It really did go under the radar, I think. And it's very cute. Bets, well to each her own, that's for sure. Although this one is light enough on the Austen that you might be able to enjoy it anyway.